Poem contemplating life energy after Grand Forks flood. 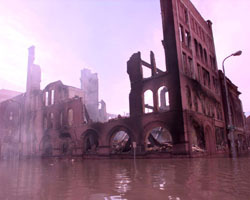 Devastation of downtown Grand Forks during a big flood in 1997. Water from the Red River rose to second story of buildings while fire ravaged through upper floors. Roads under water and North Dakota doesn't have fire boats. Photo from Grand Forks Herald. I found it on the web about 1 1/2 years before my trip. Downtown Was rebuilding as I passed through in Summer of 98. Old laundry in Stanley. Almost doesn't look open. Rusty washers. Owner hobbles in, must be nearing 80. Says he'd like to close, but preacher ask him to remain in business. "No other place to go." "Still wishing those damn oil workers would only use three machines at end." "Set aside for them." "Work cloths gum up other machines." "I can't get all them to mind me." "Battle been fought since 57?" "Outside town, nothing for miles." "Everyone's been moved or died." "Jobs scarce, money flowing east." "City folks in Fargo, Grand Forks; they all get it." "Few wells still producing, new one's not drilled since 59, or so." 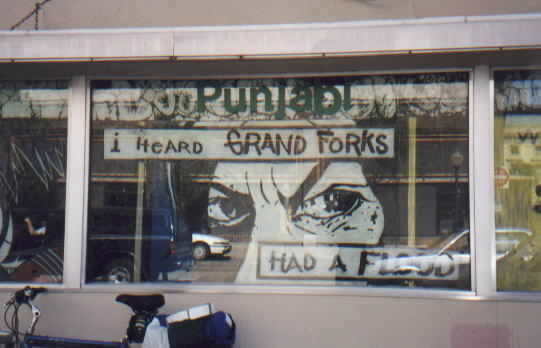 Grand Forks greets me into a bosom of vitality. Handsome young men swarming frat house lawns. Music flowing, street dances blaring, jugglers smiling. A college town at last. Get used to different atmosphere after seven days crossing state. My battered bike needs fresh things. Wheel re trued, new tire, handlebar grips, in electric green? Student / summer bike mechanic has sweet smile. Hopes he can find right things. Says, "we had a big flood come through here, inventory lost." I remark, as Michael Jackson pours forth from ceiling speaker, "One would never know." "Amazing how normal things seem; especially back at U of N Campus." "Did flood even get there?" Yes, he said. "Cadavers, from medical school, washed up and floated around in the halls." Much of downtown was still shuttered, some parts fenced off, but other sections were rebuilding at an amazing pace. I biked through in Summer of 1998.